Monaco is a payment and cryptocurrency platform that operates its own native currency known as MCO token. The project has raised $26.7 million since its launch on the 18th May 2017. 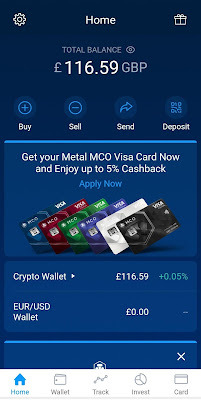 With the slogan ‘Spend anywhere, without fees’, Monaco offers Metal Visa cards and a premium mobile wallet that allows users to swiftly buy, exchange, and spend fiat and cryptocurrencies, such as Bitcoin (BTC), Ethereum (ETH) and ERC 20 tokens globally at perfect real-time interbank rates, without any fees and mark-ups. When a card is swiped, Monaco will instantly convert an increment of your BTC/ETH/ERC20 tokens to complete the transaction, echoing Monaco’s vision of ‘Cryptocurrency in Every Wallet’. Monaco is owned and operated by Switzerland-headquartered Monaco Technology GmbH and has offices in Singapore and Hong Kong. A recent acquisition saw Monaco transformed into Crypto.com, when the domain was purchased for a reported $10 million from Matt Blaze, a computer science professor at the University of Pennsylvania who sits on the board of directors for the Tor Project. This set up comes with $20 equivalent in MCO tokens as reward for the first 5 people Only, using code b4p7m48buh. Begin Sign-Up by Registering your email before installing the Wallet & Card application. Monaco is clearly a premium Blockchain project targeting the business professional with a metal Visa card. These cards can be applied for based on certain criteria like how many MCO tokens you hold in your wallet and for how long to qualify for the card. 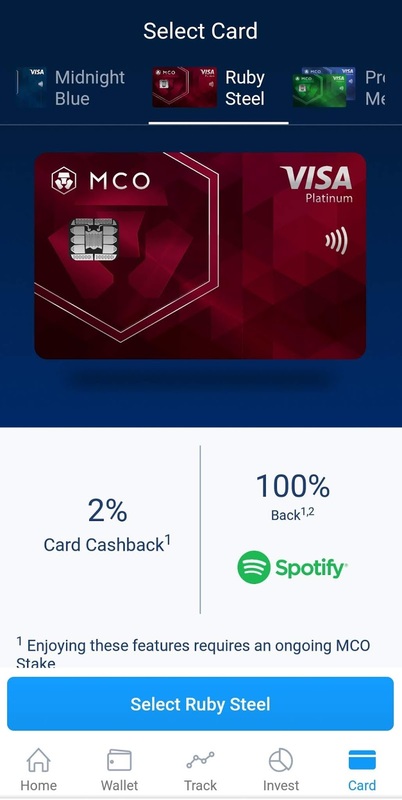 As an example, you can apply for the Ruby Red Steel Visa card when you hold 50 MCOs for 6 months, and comes with added rewards like 1 year free subscription to Spotify. Further details about the visa cards will be discussed further in this article. You have 24 hours after registering your email address to complete the set-up process. Find a link to the app in Android/iOS from the confirmation email Monaco have sent you to redeem your rewards of MCO tokens. Once installed, make sure you confirm your email address, confirm 2FA authentication with your phone and set a secure PIN for your new wallet. Monaco currently support BTC/ETH/XRP/LTC/USDM,BNC and their native currencies MCO and CRO. 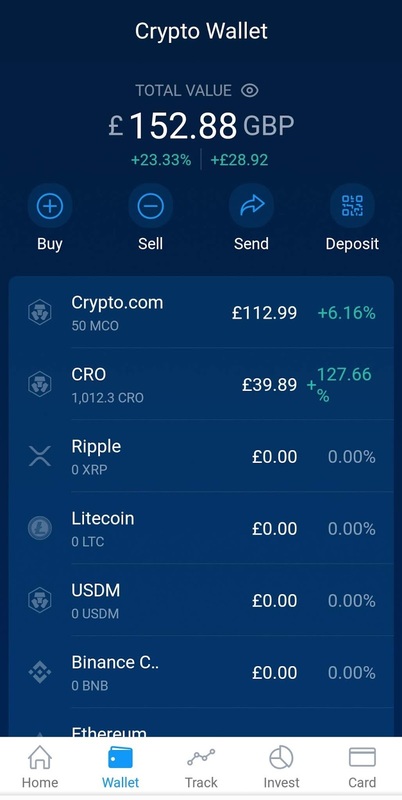 The main homepage of your wallet should look like the shot below, with your total balance displayed at the top and buttons to Buy, Sell, Send and Deposit supported cryptocurrency coins from any exchange. The settings cog can be found at the top left corner of the app, where you get to adjust various settings like currency to display, changing passcode settings, fees and limits as well as activating finger print authentication if your phone is equipped with a fingerprint sensor. 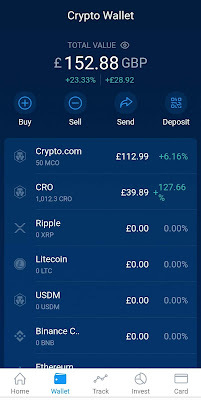 Information about the types of wallets available, total amount in the wallets and the total market cap of the coins can also be found in the home screen. This is probably where you’ll be spending the most time inspecting and sieving through coins you have transferred to the wallet. You’ll find more drilled down information about your coins on this page. Parameters like your total coin price appreciation and percentage rise and fall can be analysed here. 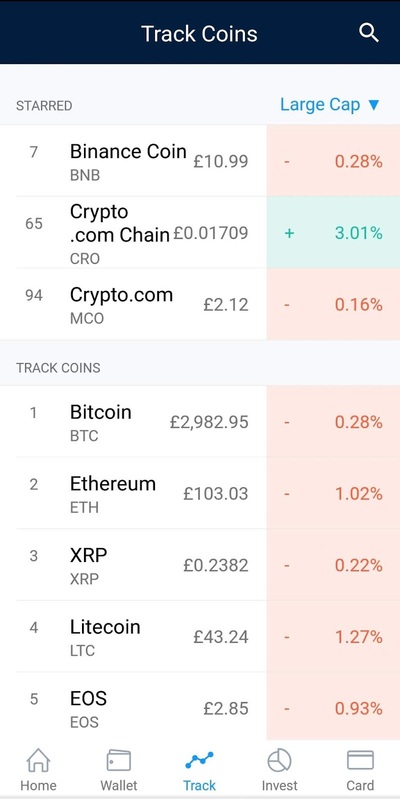 Click on any coin of your choice to view statistics and current live values across all exchanges in the world. 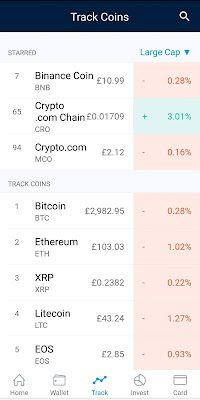 Although Monaco currently support a handful of crypto currencies, the app has an in-built tracker for checking the trends of over 200 currencies including those you may not be aware of yet. This serves as a good place to learn about different cryptocurrency projects and what real world problems they are attempting to solve. You can expect more currencies to be available in the future since the Monaco project is still in its evolution stage. Investing in cryptocurrencies can be a tricky skill to master, with lots of hours required doing research on the projects underlying the existence of the currencies. Monaco has a solution to help novice investors in the crypto space. Crypto Invest by Monaco lets you set up recurring monthly deposits into your wallet account, and manages the portfolio for you. 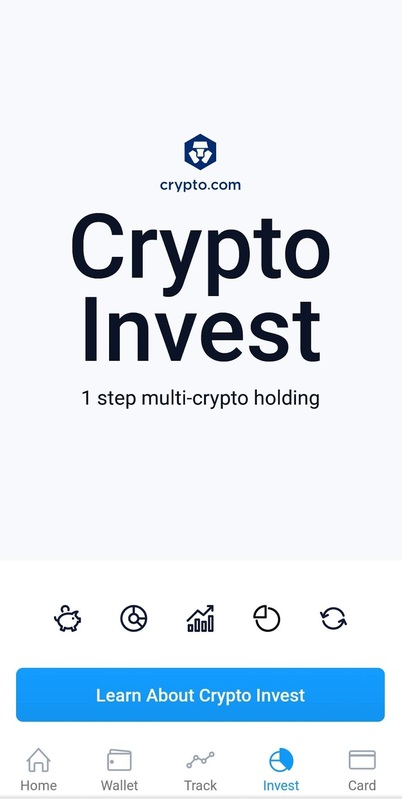 The application lets you set your preferences depending on the goals you have planned, and builds a Crypto-Robo enabled portfolio for you. There are no set up or management fees and you can withdraw your funds anytime you wish. The most exciting feature of Monaco is the option to own a card to spend your precious currencies. Visa has partnered with Monaco to make this happen because let’s face it, the liquidity of crypto assets has been a stumbling block for mass adoption since its inception in 2008. 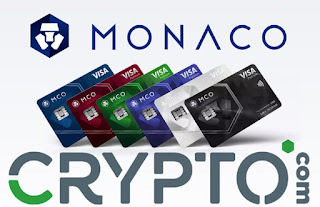 Monaco aims to change this status by issuing Visa cards for making purchases of any kind in any part of the world. 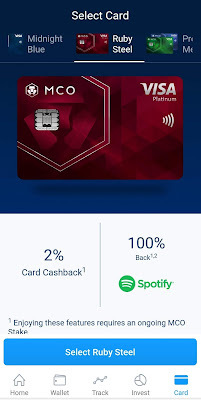 The most basic card in the range is the Midnight Blue card made from PVC, and offers 1% cashback on purchases with free monthly, annual and delivery fees. The second offering is the Ruby Steel card, pictured above which you can apply for when you lock in Monaco’s native token MCO in your wallet for 6 months. You receive 2% cashback on purchases and enjoy free Spotify subscription in reimbursement equivalent of USD 9.99. The platinum card is made of metal and £400 monthly withdrawal limit with 2% charge thereafter, and interbank rates monthly limit of $4000 with 0.5% charge thereafter. The next cards up are more premium and require staking larger amounts of MCO tokens to qualify, but come with extra benefits and monthly withdrawal allowances. -The Jade Green and Royal Indigo platinum cards can be acquired when you stake 500 MCO tokens for 6 months, and come with 3% cashback benefits, free Spotify and Netflix subscriptions from reimbursement and free Airport Lounge services. You have a monthly withdrawal limit of £800 and interbank monthly rates of $10,000. -The Icy White platinum card can be acquired when you stake 5,000 MCO tokens for 6 months, and come with 4% card cashback, free Spotify and Netflix, 10% cashback on Expedia and free Airport Lounging with one extra guest. You have a monthly withdrawal limit of $800 and interbank rates limit of $10,000. -The Obsidian Black platinum card can be acquired when you stake 50,000 MCO tokens for 6 months, and comes with 5% card cashback, free Spotify and Netflix, 10% cashback on Expedia and AirBnB, and free Airport Lounging with one extra guest. You have a monthly withdrawal limit of $1,000 and unlimited interbank rates limit. The cards are currently available to citizens of Singapore with a rollout to other parts of the world like Europe and USA planned for later in 2019. Keep an eye out on their Reddit community for up to date information and developments in the space. The project is an absolutely interesting one that strikes everyone with intrigue for Blockchain. Businesses can also save up to 80% on payment processing cost, by adopting cryptocurrency payments systems with low or zero fees. Feel free to ask any questions and join the conversation on our Reddit group and other social media.